Attention MUCA Member employees: If you have a senior in high school who will be pursuing further education after graduation (trade school, technical college or university), encourage them to apply for a MUCA Scholarship! They can apply online or download the PDF. Applications must be received by MUCA no later than end of business day, Friday, May 10, 2019. “Golf is the best way to ruin a good walk” said Winston Churchill. Luckily for MUCA Members and industry friends, we have the BEST golf outing in the State! Registrations for both sponsorships and golfers is now open! The ending dates for Winter Load Increases and the starting date for Spring Load Restrictions have been updated. Top Golf was Top Fun! What a great way to warm up your golf swing for Spring! 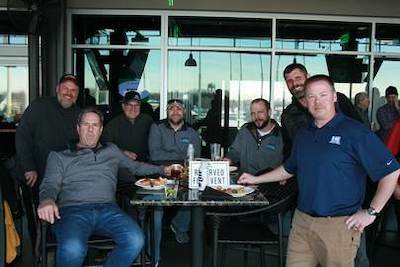 We had over 125 industry folks join us at Top Golf for the “Dig, Pave, Drive to the Top (Golf)” event last Thursday. The food was great, the service was excellent, and we had two coaches available to help both the novice and the experienced golfer improve their technique. On behalf of MUCA, MAPA and MTA, thanks to our fantastic sponsors! The Minnesota Regional Common Ground Alliance and Gopher State One Call invite you to get ready for a busy construction season by attending a free damage prevention meeting in your area. Let’s keep our crews safe this year! From Lakeville and Brainerd, to Marshall and Baudette –there is a Damage Prevention Meeting near you! This a great opportunity for contractor members to be recognized for your outstanding safety in 2018. Entries must be received by end-of-day, Friday, April 26, 2019. Awards will be handed out at the Jeff Hanson Memorial Last Ditch Open on June 20. Download your form here. Don't forget these upcoming events! Jeff Hanson Memorial Golf Tournament — Sponsorship Registration Is Open!